And why not? Would anyone of us want to have garbage dumps in our backyard? It is our garbage, then why not our backyard? 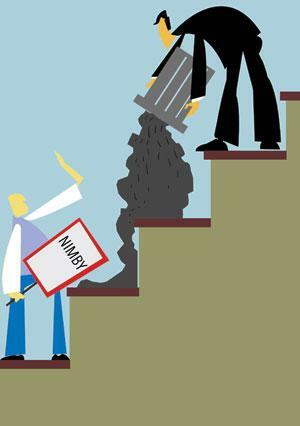 The fact is that Not-In-My-Backyard (NIMBY) is a game- changer in waste management. The global history of waste management is testimony to this. In the early 1980s, ships carrying mountains of garbage from rich cities of the US and Europe to Africa had become a global scandal. This led the world to agree on the Basel Convention on the Control of Transboundary Movement of Hazardous Waste and their Disposal. It was the NIMBY of the global rich—people in New York, for instance, did not want the waste or its disposal in their backyard—that had pushed the waste into the backyards of the poor of Africa. But as the poor rose in protest, the rich had to take back their waste and devise ways of managing it that would not lead to stink in their front yards. This is how waste management has evolved in the Western world. They have no option but to reuse, recycle or incinerate waste in their own backyard. This is why India should be celebrating its own NIMBY. For so long we have used the backyards of our cities, where the poor live. But as literacy and political and social empowerment are growing, people in poor neighbourhoods or in villages are saying enough is enough. “Your waste cannot be dumped in our backyard.” But their protests are not being heeded. In fact, city governments and judiciary invariably rule against such protests. This is because waste disposal is seen as an important municipal task. In this way, protests against building dump sites or compost units or waste-to-energy plants are judged to be unnecessary or illegitimate. Protests have different outcomes, depending on who is protesting, the rich or the poor. This is why the NIMBY of the poor is different from the NIMBY of the relatively rich. Protests by the middle class invariably push the problem to somebody else’s backyard, where it is assumed nobody lives. But this is where the poor, till now powerless to protest, live. When poor neighbourhoods refuse to remain quiet, waste cannot simply be hidden away. It has to be managed differently. This NIMBY of the poor has the potential to drive a waste revolution, where waste is no longer waste but a resource. This is what is happening in the frontrunner cities of clean India. These cities have reinvented solid waste management, because they had no choice. Vilappilsala village, which wanted to stop Thiruvananthapuram from dumping its waste in the village, lost the case even in the Supreme Court. But the villagers in this case have stood firm and now the city has had to find alternatives to its ways of handling waste. The municipality has said that it cannot collect waste as it has no dumping ground. So, city residents have to either live with the stinky waste or learn to segregate, process and recycle it. All this is happening. A similar agitation has forced the neighbouring city of Alappuzha to stop its only landfill. Garbage mutinies are growing. In Pune, the village of Uruli Devachi has repeatedly said that it has had enough of the city’s garbage. In Bengaluru, villagers are protesting against the Kannahalli as well as the Bingipura garbage disposal sites. In Vellore, 18 villagers around the Sadupperi site are up in arms against dumping. The list goes on. More importantly, this dissent will only grow as it should. As yet, city managers, like in Delhi, are still working to get land for waste. They hope they will shut up the dissent, or get a court order in their favour or get some land, somewhere. Till then, they continue to dump waste and hope that the mountain does not come tumbling down. This is not sustainable. It is time we accepted that this dissent is not just legitimate, it is necessary. This dissent will demand that Delhi does not go looking for another dump site. The city should instead begin to manage its waste in its own backyard, not in that of the poor. And for this, all manners of waste processing—composting, generating energy from waste or recycling—will have to be done. After all, it is our waste. It should be our backyard as well.